There had been a plan to have a go at Stob Ban & Mullach nan Coirean yesterday. A quick look at MWIS on Friday suggested that wisny going to be a terribly dry, windfree or enjoyable option. 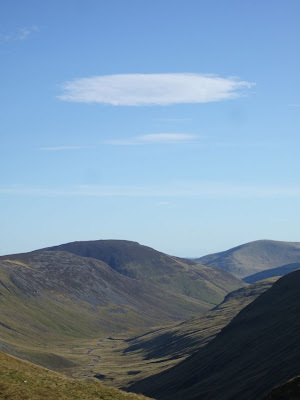 The forecast was significantly better for the east though, so after scouring tinternet for inspiration, me & Andy decided to head for Glenshee and pick off Beinn Iutharn Mhor. 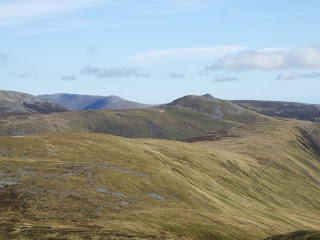 It's invariably done with other hills, but a one-summit trip kind of suited us, and anyway, we remembered how bloody far the walk out through Gleann Taitneach had felt last time we did it, on the way back from Glas Tulaichean and Carn an Righ. We still weren't expecting all that much weather-wise, but, in the event, it couldn't have been nicer. Blue skies, great visibility, sunshine and a nice cooling breeze just when you wanted it. 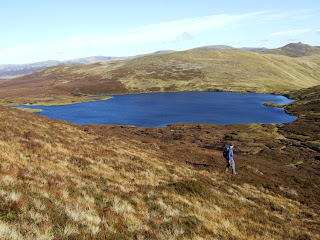 Perfect hillwalking conditions. And all the sweeter for being unexpected. I really like the hotel at Dalmunzie, which was the starting point. The £2 for parking is not only reasonable, but they give you a wee raffle-type ticket to stick on your dashboard, and ask you if you're expecting to be back the same day, so it's an extra bit of reassurance, which never goes amiss. Actually, when I went round to reception to pay the couple of quid, the sight of folk sitting on the lawnchairs enjoying breakfast in the glorious sunshine, while pheasants wandered across the grass, the evocative scent of woodsmoke in the air...we were nearly thinking about no bothering with the walk and just booking in to spend the day eating and getting drunk. As single minded Munrobaggers of course, there was no real danger of that happening. We started walking about 10:15. Up the road past the hotel, then turn right through a gate and onward about a mile to a bridge over the river. 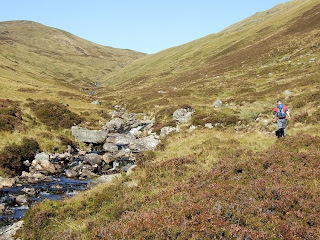 After you cross, you simply stay on the east bank following a path that runs all the way up Gleann Taitneach, which is undeniably rather pleasing to the eye. 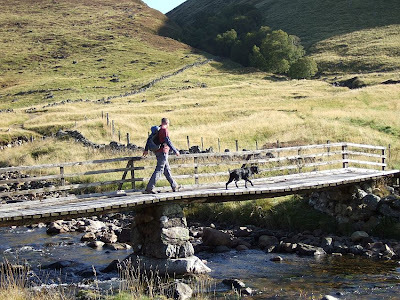 A couple of wee streams to ford, and the water level was just low enough for us to make use of stepping stones – although they were deceptively slippery. You pass various mini waterfalls on the way, and it’s a perfectly pleasant wander that never feels as if you’re having to work to gain height. 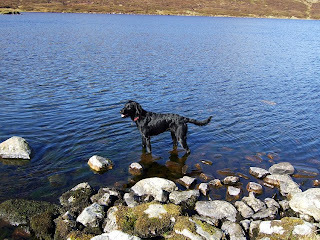 It took us two hours on the dot to get to the shore of Loch nan Eun, which is definitely from the Loch Eilde Mor stable! Not such a picturesque setting, but it’s lovely and, well, blue. 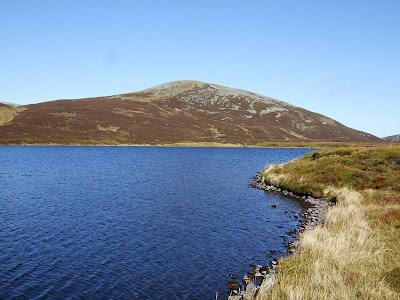 It’d be a perfect wild camping spot, although there are a few signs that it’s maybe slightly too accessible to folk that are happy to light fires and leave litter. I doubt they’d be up there in the winter, having said that. Jorja was having a great time. Apart from beasts in the field just after the start of the walk, there was no reason for her to be on the lead for the full seven hours. 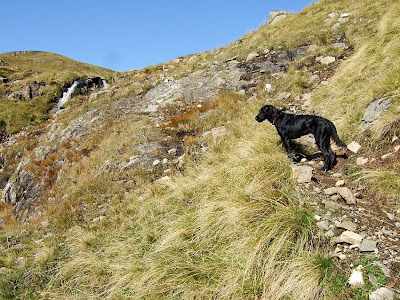 Unless you class her relentless pursuit of mountain hares as a reason, but I’m afraid she’s won the battle with me on that one. Weighed against her hauling me along in her wake, the hopeless chases she indulges in are a price worth paying, in my book. 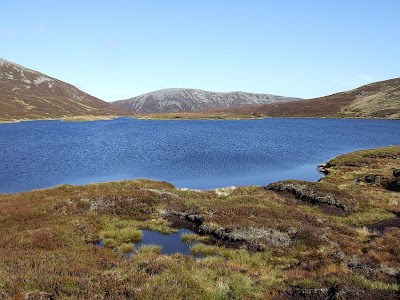 We circuited the loch and then headed for an obvious low point on the ridge between Beinn Iutharn Beag and Mam Nan Carn. 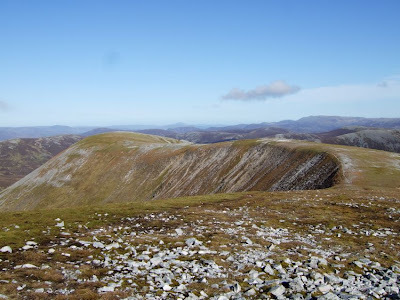 You can traverse behind Mam nan Carn and head for the bealach below Beinn Iutharn Mhor, but we just decided to visit the summit en route, as we could sense we were missing out on the views, and we didn't think it was far away at all. Summits are always further away than they look, eh? 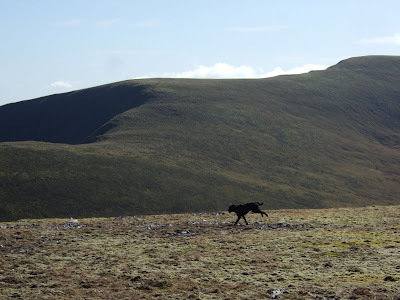 Jorja has of course come to realise that the appearance of a cairn on the horizon means that either there will be folk eating sandwiches, or at the very least there will have been folk eating sandwiches - who'll maybe have dropped something. So these days, she just runs on ahead. 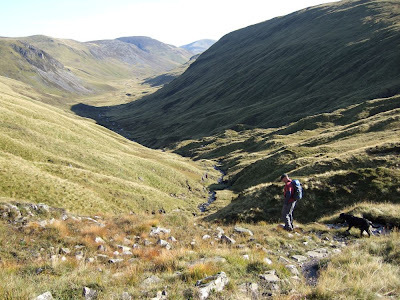 From there, a bit of descent takes you to the start of an obvious path up Iutharn Mor itself. Again it's not an arduous climb, and it probably only took us about 15 minutes from bealach to cairn. 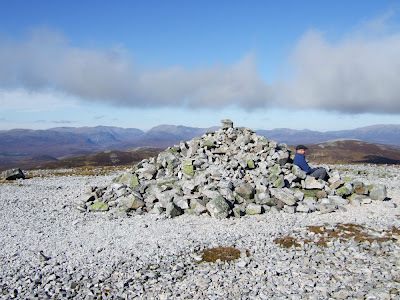 A jolly nice cairn, incidentally. 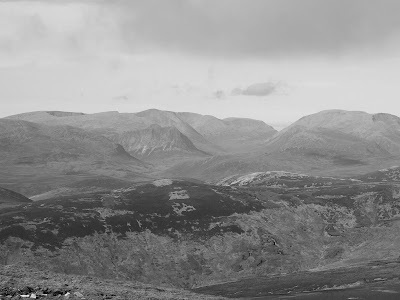 ...toyed even more briefly with the idea of doing Carn Bhac or An Socach...and then just went home the way we'd come. Ach, it had been a good day, and you can take these things too far. The views on the way back were probably better than they had been on the road up. The shadows in the glen helped, somehow. 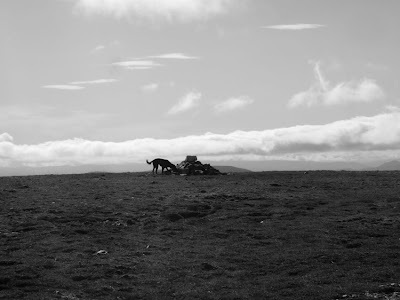 The walk took us about seven and a half hours altogether, which was admittedly a bit slow, but again it added to the relaxed enjoyment which is whit it's supposed to be about. Rattled homewards in jig time. Less than two hours from the hotel to the house is no' bad going - it's really quite a good road, traffic wise. Not as stressful as the A9, at least. 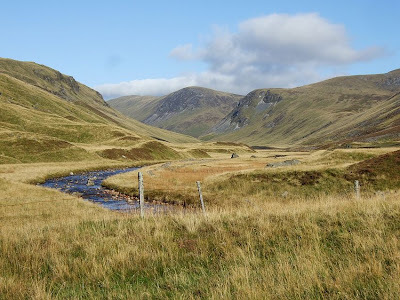 Quite fancy staying at Dalmunzie with a wee stroll in the hills optional. 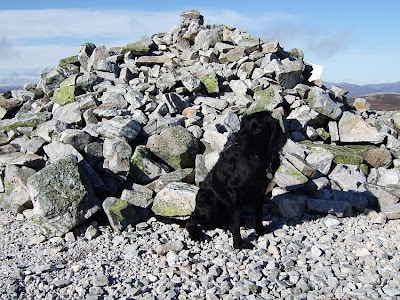 Black dugs , wee or otherwise, soon pick up on the cairn thing. I know of one such creatur that needs to be hitched up as soon as the pile of rocks at the top comes into view! Looked very nice weather Scott. Hmmm off to look at my map now. Haven't plotted that walk yet.